I thought that the middle-grade novel Posted by John David Anderson sounded fun and humorous, and it was. But having never read any of Anderson's earlier novels, I was surprised by the emotional depth and warmth of this middle-school story and thoroughly enjoyed listening to it on audio. Frost got his nickname years earlier when he won a 5th grade poetry contest. When he first started middle-school, his mother advised him to "find his tribe," but at first that seemed impossible. Then, he bonded with Bench during a field trip, and the two of them got to know Deedee and Wolf, and his tribe was formed. The four of them were each misfits on their own, but together - with their nicknames and inside jokes - they became an inseparable team. Then, one day, the unthinkable happened: a new girl named Rose started at their school, a misfit herself because of her large stature, and sat down at their lunch table, causing friction among the four of them for the first time. At the same time, something revolutionary was happening at Branton Middle School. After a particularly inflammatory text message quickly spread throughout the school, their principal banned cell phones. The entire social structure of the middle-schoolers was threatened by this sudden absence of instant communication. Deedee started leaving Post-it notes on his friend's lockers, which started a trend that soon grew out of control itself. It might have been low-tech, but students were soon using the ubiquitous sticky notes for both good and evil, including some serious bullying. I was quickly pulled into this engrossing story of Frost and his best friends, with its multiple, intertwined story lines. Will their tribe survive a new member? And how will the sticky note war finally end? Along the way, there is loyalty, bullying, parents' marital problems, and so much more. 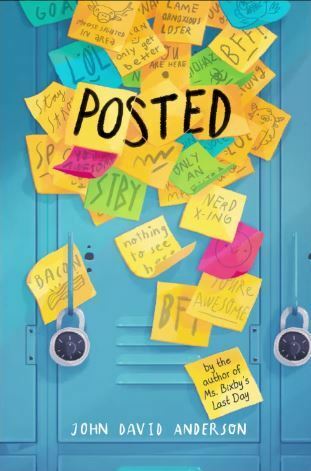 Anderson has captured the complexity of middle-school social structures, with their quickly changing connections, through the eyes of four outsider geeks and a new girl determined to have a better experience at her new school. Along the way, friendships are made and lost and made again, as each of the kids tries to figure out how to survive and thrive. I enjoyed this warm, poignant, and often very funny story of middle-school friendships. Listen to a sample of the Posted audio book to get a feel for Anderson's warmth and sense of humor. Or order Posted from Book Depository, with free shipping worldwide.